​The FS421M additive metal melting system is a true manufacturing systems capable continuous production. With its 425x425x420mm build volume the FS421M is capable of producing large metal parts from a wide range of metal powder materials. The large build volume combined with a multi-laser and fully digital optics system enable enhanced production speed while the internal rail system enables the fast exchange of cylinders between builds. ​The 252P series is capable of achieving chamber temperatures of up to 220°C and 280°C with the HT252P and ST252P systems. Enhanced temperature shielding, laser power and thermal controls enable the 252P series to process high-performance materials such as PA6, PA66, and PEI for direct-use applications. ​The FS421M comes equipped with an all new closed looped powder handling system. 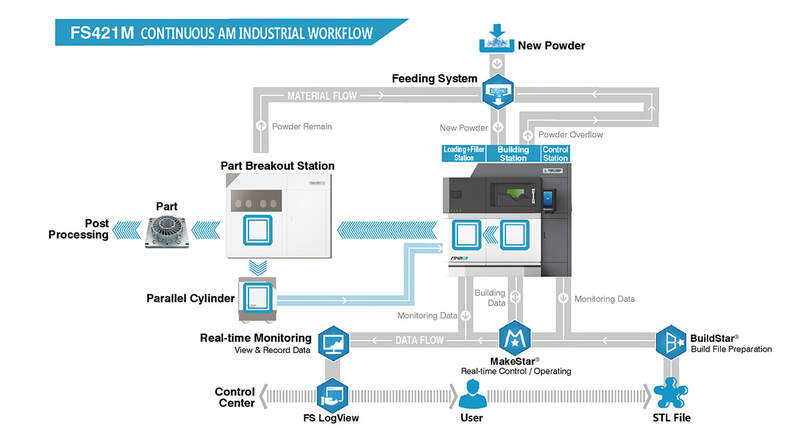 Powder supply, transport, feeding, and recycling are all integrated into one inert system. The FS421M's powerful and highly efficient air filtration systems allows for the processing of reactive materials while it's high capacity and auto-cleaning capability allows for extended use between filter changes. ​The FS421M like all Farsoon systems allows for complete freedom of operation by its users. This means that all machine parameters are unlocked for the user as well as an open material policy allowing for previously-impossible levels of freedom and flexibility when it comes to additive metal melting production. In addition, the in house Farsoon software allows for ease of use with both an advanced user interface as well as a touch screen based production interface for everyday use.